The Episcopal Complex of the Euphrasian Basilica in the Historic Centre of Porec is one of the best examples of early Byzantine architecture and art (mosaics). The basilica was rebuilt from the year 553 under the Byzantine Empire and bishop Euphrasius on the site of the older basilica that had become dilapidated. For the construction, parts of the former church were used and the marble blocks were imported from the coast of the Sea of Marmara. 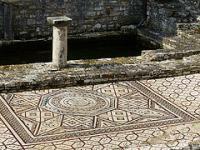 The wall mosaics were executed by Byzantian masters and the floor mosaics by local experts. The construction took about ten years. A 6th-century octagonal baptistery - Built in the 5th century together with the pre-Euphrasian basilica, and underwent considerable alterations. A 16th-century bell tower - Built in the 16th century from top of which there is a view over Porec, the surrounding countryside and the sea. A colonnaded atrium - Built after the basilica, it is covered on all four sides by a portico which houses a rich collection of stone monuments. An Episcopal 6th-century residence (The Bishop's Palace) - Also built in the 6th century, but very little remains of the original building. A trefil-shaped memorial chapel - Built in the 17th and 19th centuries. 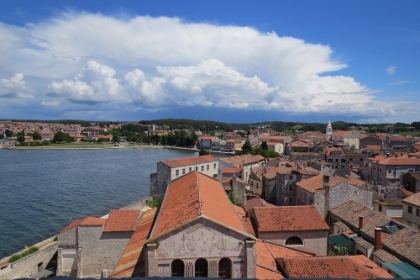 Porec lies in Istria, at the top end of the stretch of coast that forms Croatia. It can be easily reached from Italy or (as I did) from Slovenia. It has all the characteristics of other Croatian towns that I've visited over the past few years: pretty silhouette against the mediterranean, grey stones, orange tiles. It really is different from the mountaineous and forested Slovenia. The town is small enough to easily get your bearings. There's a large public parking just inland of the old city center. From there I walked along the seashore to the sharp tower that indicates the location of the Euphrasian Basilica. Entry is from the back, somewhere in the warren of streets, but I found it rightaway. There's an entrance fee of 40 kuna (about 5.20 EUR). There were a handful of other visitors around. The basilica is a complex of buildings, and there's a route signposted that takes you through all of them. It starts at the atrium, a nice open space nowadays where a group of musicians were rehearsing for some concert later. Behind it lie the stairs that will bring you to the top of the bell tower. Climbing it is a must here: it has great views over the orange-tiled roofs of Porec, and on the mosaics that cover the facade of the basilica. 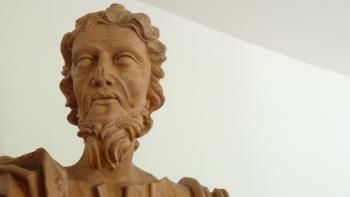 When you study the figures in the apsis closely, you'll discover Bishop Euphrasius himself. He is carrying a model of this basilica in his arms. I visited this WHS in May 2014. It’s the only Croatian WHS in the Istrian peninsula and it’s worth a visit. It’s very reminiscent of Ravenna and there are outdoor mosaics in the courtyard and facade as well as indoor mosaics too. It’s nothing extraordinary in my opinion when compared to the size, quantity and quality of the mosaics in similar WHS in Italy such as those in Aquileia or Ravenna. The entrance ticket costs 40 kunas now instead of 30 kunas and it gives you access to the basilica, the courtyard with the outdoor mosaics, the belfry and the museum. The view from the belfry is worth the few stairs especially on a sunny day. All in all, it is a worthwhile stop if you’re in Istria but to me it isn’t one of Croatia’s best WHS. I had tried to reach Porec in 2012 from Koper in Slovenia, but the last bus had left the day before (30 Sept), with no more until spring. So in 2013 I caught a bus from Rijeka and travelled through the Istrian Mountains to Porec. At the end of Oct there were still frequent buses but few tourists. 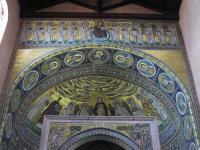 I found the mosaics at the basilica stunning, and like Klaus very reminiscent of those at Ravenna, Italy. We visited Porec in June 2006, it was the last stop during our trip through Croatia. 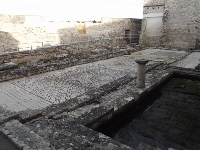 The Basilica in its present form was built in the 6th Century, but the remains of older buildings show that the site was used long before for sacred purposes. 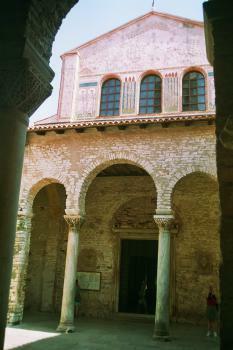 In the centre of the complex is a beautiful atrium (photo, with the main portal of the basilica). I also climbed the bell tower, I always like to have a look at a town or site from above. But the highlights are the remains of Byzantine art in the basilica and the adjacent museum. 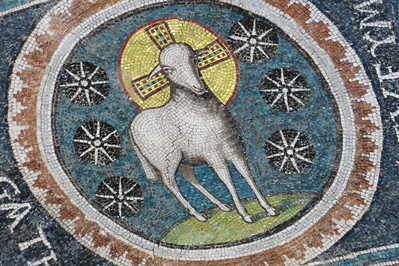 The mosaics are reminiscent of other early Christian sites in the Adriatic region, such as Ravenna and Aquileia. 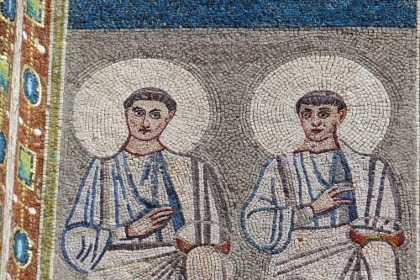 Particularly the mosaics in the apse show great similarity to those in Ravenna, that you ask yourself whether they might have been made by the same artist. We have only visited the basilica complex, at the end of our trip we were tired of crowded Croatian towns. But later trips in early spring have convinced me that Istria is a worthwhile destination: beautiful towns along the coast (eg Rovinj) and forested hills in the inland, where you can enjoy nature and simple but delicious traditional food. As the others have said below Porec is a pretty town that can seem somewhat lost under tourist paraphernalia; however the basilica and especially its mosaic decorated apse are really worth going to visit. The museum attached to the basilica and its bell tower also provides nice additions to the golden mosaics. I really liked sitting on the walls next to the sea inside the compound before ducking back in to have another view of the decorations. Despite being a tourist hotspot, I found public transport connections to be a little limited; as such I was left with the option of either 8 hours or 1.5 hours in Porec. I gambled on the lesser being enough and I don't think I made the wrong decision. The rest of the town is a pleasant maze of cobbled streets and waterfront boulevards; however every space was given over to the trappings of the tourist industry which made the experience a little underwhelming. This stretch of the Istrian coast was really pleasant and I had a wonderful time in Pula further to the south, and Rovinj also looked like a worthwhile destination. The basilica complex is really worth a visit on this extremely pleasant stretch of coastline. Whilst the atmosphere of the town wasn't exactly to my taste, it is a pretty place and certainly deserving of exploration. Porec is beautiful small town on the west coast of Istria and today overrun with tourists for six months of the year. It does have an interesting history, though, and this is reflected in the complex of the city's cathedral, named the Euphrasian Basilica for an early bishop. In the early middle ages, the region was part of the Byzantine Empire for about 200 years, and the church's beautiful decoration and especially the mosaics (also visit the adjacent museum!) are evidence of that. 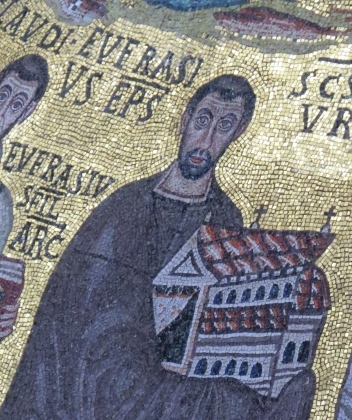 There is probably no place outside of Ravenna where early Byzantine art is so well represented, since Istria ceased to be a part of the Empire before the iconoclasts destroyed similar works of art in Constantinople and the eastern Mediterranean. So even if you have come to Porec for the beach and the food, a visit to this great cathedral is definitely required. Porec is a cute town on the Adriatic coast, unfortunately way too crowded with tourists. The basilica is nice, and the golden mosaics are stunning.